If you’re buying an electric bike for Christmas you’ll be fine to use it in the UK. But in the New Year, a bike with a “Twist and Go” throttle which will be reclassified by the DVLA as a motor vehicle. All electric bikes with motors more powerful than 250W (rated) will need to be registered and the rider must hold a current driving licence and abide by the laws relating to mopeds. Pedal assisted bikes will be exempt from motor vehicle legislation, particularly if they use a motor of no more than 250 watts and the maximum speed they travel is 15.5 mph. These will be classed as a normal pedal bike and means you can ride or on cycle paths and anywhere else where pedal bikes are allowed. 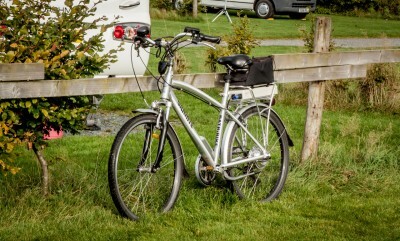 These new rules are part of the Electrically Assisted Pedal Cycles – EAPC – (Amendment) Regulations 2015. If you already have an electric bike then you don’t need to worry – the new regulations will not be backdated. To read more visit: https://www.gov.uk/electric-bike-rules. 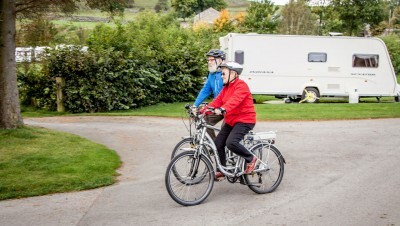 If you own an electric bike and take it touring then take a look at our Gadget and Leisure equipment insurance, which is exclusive to Caravan Guard policyholders. It provides full accidental damage cover, accidental loss and theft, plus more. Click here for more details. Actually we have now bought an electric assisted bike, for my wife who has had a heart attack, so she can get exercise on it. We are currently in Holland with our two bikes on the back of the motorhome, enjoying riding round rivers and canals in forests. Her bike does not have a twist accelerator, it just adds electric assistance when pedalling, if the electric power is switched on. You can ride it just like an ordinary bike with no electric power, or select one of four different power assistance levels. You still have to pedal, you can’t just sit there and glide along. I think this is the purpose behind the new rules, otherwise you could just have a 1kW electric bike (and I have seen them advertised) which would do 50mph without insurance or any safety gear. We have just found a fantastic place to overnight, actually just inside the German border from Holland. It is a forest with lakes, rivers and cycle tracks that go on for miles and miles. The car park is free and is big enough for motorhomes, it is far superior to proper camp sites with all their regulations and fees. Thanks Andrew. It sounds wonderful where you are staying and great that you’re getting use out of the bikes. I am surprised that the DVLA have come up with this. Perhaps they wanted to get in before the powers that be in the EU created a mountain of paper standards and regulations for electric cycles. Still if we stay in then I am sure something will appear from the United States of Europe. Here we go. Yet another committee convened to think up unnecessary laws which are designed purely to employ more people. I expect the legislation will cover one item but forget others, like the scooters. A pedal cyclist can do 40mph without adhering to any rules or have any insurance but stick an electric motor on it and all of a sudden the rider will need to have it registered, which means they will have to buy insurance, and an MOT when it is 3 years old. If they have to adhere to the same rules as a moped then the brakes, lights and horn will have to work, the steering and wheel bearings will have no wear, the rider will have to wear a BSI approved crash helmet and protective clothing, and the tyres will have to have a minimum tread depth of 1.6mm, although bike tyres do not have that much when they are new. Of course the electrical connections will have to be tested for safety as well. Next they will be saying that you can’t apply for an MOT unless you have a receipt saying it has been serviced at an authorised dealer. It’s a shame that the powers that be have not used the time to look at the use of Pavement scooters (disabled scooters) In my experience in a seaside town where a lot of these machines are in use is that the “drivers” have far less consideration for anyone else than electric bike users. We hope you continue to enjoy your twist and go bike!